Minor league umpires are much like minor league players. When they finally get a chance to prove their stuff in the big leagues, they want to succeed. The biggest difference is, when a player gets the call he wants to do something spectacular to impress his bosses. The mark of a great umpire is when no one notices him at all. Chris Conroy got noticed. 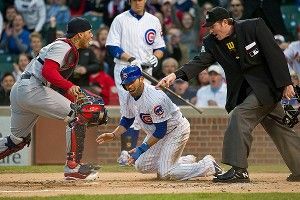 Normally a Triple-A umpire, Conroy got called up as a vacation replacement for this week’s Cubs-Cardinals series. He hadn’t had many chances before — 16 games in 2011, just one in 2010. He’d been on the periphery for an egregiously bad call last year, when crew mate Phil Cuzzi awarded a three-ball walk to Cameron Maybin, who later came around to score the only run in a 1-0 Padres win. But for Conroy, a first-inning play at the plate Tuesday night was worse. Much worse. David DeJesus is on third base, Starlin Castro at the plate. Fly ball medium right field. Carlos Beltran catches it, throws a strike to Yadier Molina. 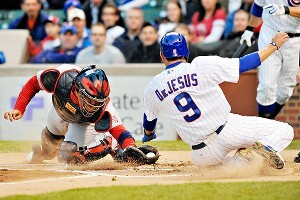 DeJesus slides in, leading with his left hand. He does indeed avoid the Cardinals catcher’s tag. He also avoids touching home, by a substantial margin. Conroy points to home plate and makes the call. Safe. Watch the replay. Conroy blew the call. Well, sort of. There’s no question DeJesus missed the base. But did Molina actually tag DeJesus? The video, and this screen cap from Baseball Prospectus writer Jason Collette, say Molina might have brushed DeJesus’s jersey. If he didn’t, the play should theoretically have remained live until DeJesus casually stepped on home on his way back to the dugout. Of course Molina wouldn’t have stopped to argue with Conroy had the initial, clearly incorrect safe call not been made, which means he probably would’ve tagged DeJesus out on the way back, before the runner could touch home. The whole thing was a big, fat mess. It was also a rare occasion where instant replay probably wouldn’t have helped. Conroy’s mistake was the equivalent of an NFL ref blowing a play dead when he shouldn’t have. Huge gaffe, but for all intents and purposes, irreversible. Therein lies the biggest problem with trying to fix umpire error: Never using technology doesn’t solve anything. The status quo, using replay only occasionally (on boundary calls), still leaves many blown calls unresolved. Always using replay would resolve some calls, even many calls. But not all of them. or at least, of being better. The biggest problem with this particular umpire whiff was the situation. The Cubs carried that ill-begotten 1-0 lead into the eighth inning, then brought in Carlos Marmol to face Matt Holliday with a runner on, four outs away from victory. It seemed the Cubs would ride that one Conroy mistake to a win. This was infuriating not only to Cardinals fans, but to baseball fans who’d seen it happen so many times before. Blogger and truth enthusiast Jacob Grill-Abramowitz identified the following list of blown calls that either played a major role in swinging the result of a game (or at least made big headlines for the wrong reasons). My frustrated elaborations are included because ARGHHHH. • April 22, Rangers vs. Tigers: Bases loaded, nobody out, tie game, extra innings. Ron Washington orders a squeeze play from Adrian Beltre fill-in Alberto Gonzalez (which now makes 92,671 suboptimal in-game moves by Washington for his career, if you’re keeping score). The play works anyway, when Gonzalez’s bat makes contact with a high pitch, sending the ball toward the mound and cashing what would prove to be the winning run. Except replays show the ball clearly hit Gonzalez in the knee, which should have made it a foul ball. We don’t and can’t know what would have happened had the play been called correctly. Would’ve been nice to get the chance to find out. • April 15, Dodgers vs. Padres: “Confusingly, home plate umpire Dale Scott threw up his hands — not once, but twice — after the ball hit the bat, which usually signifies a dead ball. But once catcher A.J. Ellis picked up the ball, Scott pointed to it, ruling it live. Thus: an historic, awesome, rally-killing triple play.” This was in the ninth inning of a tie game, by the way. • April 15, Reds vs. Nationals: Referenced in Monday’s column as the Laz Diaz Game of Death for the home plate umpire’s abysmal ball-strike calls. But for all of Diaz’s creative screwups, Ryan Ludwick never gets to the plate to hit a first-inning grand slam if not for fellow umpire Mike Everitt’s oopsie at first base. The Reds ended up winning the game in extra innings, something that very well might not have happened without those four gifted runs. • April 16, Red Sox vs. Rays: Jose Molina’s good at framing pitches. But come on. Larry Vanover is so not invited to Cody Ross’s house for Pictionary and Hot Pockets. • April 17, Twins vs. Yankees: Love the headline: “Minnesota Twins lose to umpire and Yankees.” This is somewhat borderline because it’s more of an all-encompassing set of complaints on ball-strike calls rather than one smoking gun. • April 21, White Sox vs. Mariners: Did Brendan Ryan swing, or didn’t he?. A Ryan walk probably wouldn’t have led to a Mariners win. You can debate whether a borderline call should ruin a perfect game. Let’s just say this was iffy at best. wiped out a Nationals base runner right before a Jayson Werth triple that would have cashed the fourth Washington run, in a game the Nats ultimately lost 4-3. LaHair’s blast gave the Cubs another chance to win the game. It also gave the umpires another chance to screw the pooch. One out, top of the 10th. Speedy center fielder Tony Campana laces a one-out single. Everyone in the ballpark knows he’s going to try to steal, even against the strong-armed Molina. Campana takes off, Molina fires to second. Campana’s hand appears to arrive at the base just before Tyler Greene can tag the runner’s midsection. One problem: Greene has deftly blocked the base with his foot, so Campana’s hand can’t, and doesn’t, touch the bag. He’s out by plenty. Or he would have been out if Bill Welke hadn’t stood right over the play, surveyed the scene, and made his call. Safe. Three batters later, Alfonso Soriano rapped a hot shot to second that glanced off Greene and into center field. Game over. Cubs win. All of this might seem like a mean-spirited assault against the men who do their best to get calls right every game, at the ends of two-week road trips, in 100-degree heat or brutal early-April cold. It isn’t. The problem isn’t that umpires mess up. It’s that there’s no way they can avoid messing up. There’s too much happening too quickly for any human being to call every play correctly. And inevitably some of those blown calls are going to cost a team a game, or at least contribute greatly to a loss. We don’t yet have sensors on every inch of every player’s uniform. But we do have instant replay, which needs to be expanded beyond boundary calls to cover a much wider range of plays. If we’re not going to replace home plate umpires outright with PITCHf/x technology, we should at least give serious thought toward solving a very elemental, very pervasive problem among umps: calling a consistent, and consistently accurate strike zone. The rebuttals are played out at this point. Once baseball gets used to using technology to augment umpiring, it won’t take long to rule on controversial calls. It sure as hell won’t take as long as watching a manager run onto the field, compliment an umpire on his mom-related sexual prowess, get tossed for said compliments, run through the entire thesaurus for the entire collection of mother-loving synonyms, then stalk back to the dugout with all the speed of a suddenly unretired Steve Balboni. And if you’re going to play the human-element card, by all means — let’s go back to cooking dinner by rubbing two sticks together and curing diseases with leeches and brain rubbing. Not ready for a full-blown robot umpire revolution? Fine. But we can do better than this. We have to do better than this.